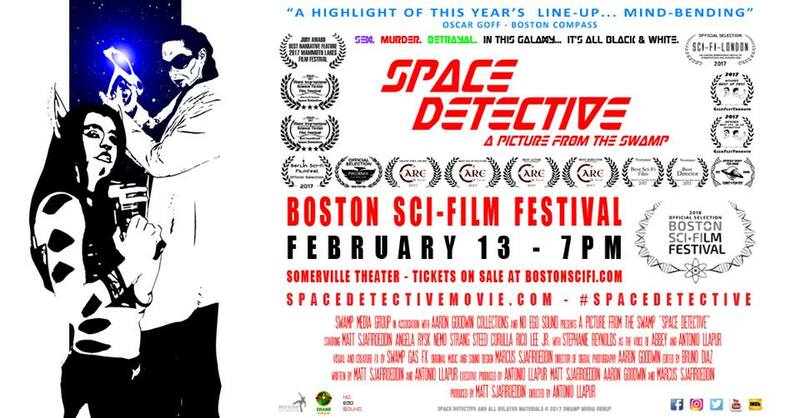 Last week, I had the chance to talk to the guys behind the new space noir movie Space Detective during the Boston Sci-Fi Film Festival. During the interview below, we discussed the painstaking processes behind the film, their inspirations, and what they hope for the film’s future. BOSTON HASSLE: Can you tell me a little bit about the movie, where the ideas came from? ANTONIO LLAPUR (DIRECTOR): Space Detective is a live-action and animated science-fiction noir adventure. It’s about a detective in outer space; I think the title pretty much says it all. When we say live-action and animated, the way we do that is we shoot our actors in front of green screen with black and white kabuki-style makeup, and then we process them through AfterEffects. So when you see the movie, your mind is tricked into thinking you’re seeing a cartoon. But that’s the actor. We didn’t rotoscope over it or anything like that. That being said, the backgrounds are all animated, a lot of the background characters are animated. We chose that style as both artistic and out of necessity. I grew up a big fan of comics, indie comics in general. I liked Frank Miller’s Sin City and the black and white high-contrast. That has always been in the back of my head. When we set out to do this space adventure, we knew there was no way in hell we could pull off complicated special effects. So we figured that if we cheat and use this black and white stuff in our processing, it would allow us to get away with a lot more. We could potentially create a really large universe on a tiny budget. MATT SJAFIROEDDIN (STAR/PRODUCER): The visual style also allowed us to cheat on a lot of props. We could build them out of cardboard and toys and just paint it. As long as it looked like metal, it would look like metal. For all of our laser guns, as long as it looked like some kind of laser weapon, it passed! AL: It also helped for our CG spaceships. Making a cel-shaded spaceship is a lot easier than complicating it with textures and lighting. We had two or three CG artists. I did a lot of the hand-drawn stuff and explosion animations. I had an assistant, Charlie Wilson, who helped me out with a lot of that. And we had Amal Dunbar, who is our 3D animator, who handled the ships and our big nightclub sequence. And this guy [points to Matt], he built all the puppets and did all the makeup and the costumes. BH: I had just assumed it was rotoscoping. AL: The only rotoscoping is his glowing eyes. We rotoscoped that. A lot of the rotoscope was to fix things, not to build characters. BH: So there’s not really sets, then. AL: No it’s really just green screen. We built one set and we just ended up putting effects over it because it didn’t quite light right. We did a couple days out in the desert to do a fight scene. We did most of it on our set, but some of it was just too complicated so we just drove out there and processed the film later to match. It’s pretty seamless, it’s hard to tell the difference now. BH: What is it like acting in something like that? How do you conceptualize yourself in this world that doesn’t exist yet? MS: It wasn’t that hard for me. As an actor, you use your imagination all the time. As the co-writer, I knew everything. I knew what was going on and where everything was going to be. AL: Everything was storyboarded down to the second. It’s Theater 101. When you take your first acting classes, you’re just in a room. It’s all pretend. It just goes back to you being a kid and just pretending there’s a robot there. Our guys really took to it. Our best is probably our female lead, Angela Rysk, who plays Jinks. She’s amazing, a theater actress. She does an amazing accent – she’s not Russian, but everyone thinks she is. BH: She seemed cool from the trailer. AL: Her and the little alien guy, Zyzzo, are my favorite performances. BH: Besides Sin City, what were the other big influences? AL: Star Wars. Batman. Anything by Jack Kirby. Star Trek. Pretty much any space opera and a lot of superhero things. We wanted to make a modern space superhero, like Skywalker or Buck Rogers. BH: Yeah, he’s basically a hardboiled detective, just in space. MS: It’s a pretty basic noir story. There’s the detective, the femme fatale, a double cross. It’s pretty simple. AL: Louis Savy, who runs the London Sci-Fi Festival, called it “Sam Spade on Acid”. BH: How long did it take to film? AL: It took a decade to create, about four or five years of shooting. Four years of principal [photography], and a year of pickups. We started post while we were shooting. It was a lot. It was my full-time job. Worked some part time gigs, waited tables, and Matt took a lot of the financial burden. Pretty much all show business stories start out like that. MS: My brother, Marcus, did all of our audio. Sound effects, recorded all of our dialogue, composed all the music. Him and one of our actors, Rico Lee. They did a fantastic job. AL: Really proud of the audio. We made a visually-striking film, we really love it, but let’s face it: that music classes us up our picture and makes it seem like a real thing. MS: Everyone talks about the music. AL: He’s won a couple of awards for it, too. BH: What kind of awards? AL: We won Best Soundtrack at Miami Sci-Fi. AL: We’ve been doing alright! [Boston Sci-Fi] is our tenth festival. We won Miami, GeekFest Toronto, Mammoth Lakes Film Festival, we picked up the top prize there. At Care Film Awards, we picked up like four or five awards there. Picture, Director, Actor… We’re doing okay! AL: Awards are okay, but it’s really about introducing our film to new fans. New Spaceheads, as we call them. BH: That’s why I love film festivals like this, you can always find something pretty intriguing. MS: You see movies you never would have seen otherwise. Especially short films. The ones I’ve seen here have been great. AL: You spend so much time on making a movie, it’s given us a lot of opportunities to travel. You just think, “Wow, I got to go to London last year, I got to go to Toronto.” It’s really neat. It’s opening doors for us. We signed with an agent in LA. They’re helping us get distribution together and we’re developing a TV series! BH: There’s so much you can do with the animation. AL: We’re writing right now. MS: Just finished the first episode. AL: Gonna be pitching later in the year. We’re pretty excited. BH: What were your favorite movies of 2017? AL: My favorite was Star Wars: The Last Jedi. Wonder Woman I loved. Probably my two favorites. MS: Looking forward to Black Panther. AL: Creed was great. Michael B. Jordan is a great actor, I’d love to direct him in something. He was the only thing I liked in that terrible Fantastic Four movie. BH: Is there anything I should look out for when I watch Space Detective? Anything you’re particularly proud of? AL: I’m proud of the whole thing. Proud of the random rap sequence in the middle. Try to figure out what part I play in it. I’m not the guy with the horns. MS: I’m proud of all the performances. We lucked out and got some very talented people. AL: We crafted some performances for folks, built characters around them. I’m proud that the acting is good in our movie. I’m proud of Matt. Best friends since we were kids. The thing I’m most proud of is that I get to show my movie to folks. When you watch it, that’s me. You see my personality and his personality in every frame of this picture. We cannot wait to start the TV show and show more of our expanding universe, and get this movie out there and show it to everyone. MS: You will not be able to count all of the easter eggs. Even we can’t count them. AL: I can make a drinking game for every Batman reference you find in the movie. BH: Everything you love is just in there. AL: You see a TARDIS fly by at one point. I think of the movie as “human pop culture filtered through what an alien might see.” So if an alien was watching us, they may reinterpret it like this. Pop culture through an alien lens. It’s a lot of fun and I hope people come out and watch with us. 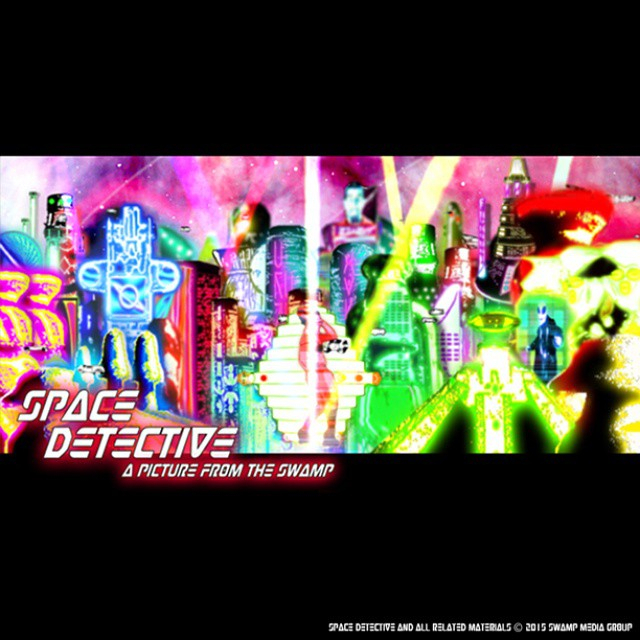 More information about Space Detective can be found at Swamp Media Group.